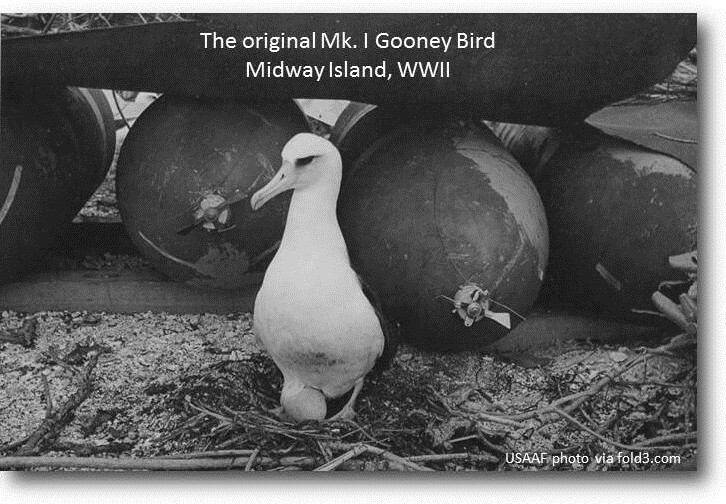 "Gooney Bird" was the nickname first applied by nineteenth century mariners to diomedea immutabili, the feathered inhabitants of Midway and other northern Pacific islands. The raucous Gooney soars through the air with seemingly effortless grace but exhibits a comical tendency to ground loop while on terra firma. During World War II, American GIs affectionately applied the tag to a bird of their own—the Army Air Force’s C-47 transport, the military version of the Douglas DC-3, the most famous of the legendary Douglas Commercial series of airliners produced by the Douglas Aircraft Company of Santa Monica, California. The genesis of the DC-3 can be traced to a 1932 specification issued by Transcontinental and Western Airlines. The 1931 in-flight disintegration of the wooden-winged Fokker F-10A in which legendary Notre Dame football coach Knute Rockne was killed prompted a government mandate to regularly inspect the ribs and spars of these aircraft—a time consuming and costly process. TWA wanted a safe, modern aircraft capable of carrying at least 12 passengers a distance of 1,080 miles at a cruising speed of 150 mph. The Douglas design staff, which included John K. Northrop, later of "flying wing" fame, quickly responded to the challenge. With the exception of fabric-covered control surfaces, the new aircraft would be of all metal semimonocoque construction; meaning that the aluminum skin carried some of the structural and dynamic loads. The low wing configuration allowed an obstacle-free aisle, and the interior of the fuselage offered enough headroom for passengers to stand upright. A lavatory was provided in the rear of the cabin. The DC-1, as the new aircraft was designated, rested on two main landing gear which retracted part way into the engine nacelles. Split flaps were installed, and twin 690 hp Wright Cyclone radial engines turned variable-pitch Hamilton Standard propellers. Only one DC-1 was built, which served mainly as a test aircraft. On 19 February 1934, TWA President Jack Frye, with World War One ace Eddie Rickenbacker in the co-pilot’s seat, flew from Palmdale, California, to Newark (with two refueling stops) in the astonishing time of 13 hrs 4 minutes. The DC-1 went on to set or break a number of records in mid-1935. The aircraft then passed to a number of owners, among them Howard Hughes, before being written off in December, 1940, after a crash in Spain. The DC-1 was followed by a production model, the DC-2, which incorporated a two-foot “stretch” in the fuselage. Total Douglas production amounted to 193 units, which were sold to several domestic and foreign airlines and included both transport and cargo versions for the Navy and the Army Air Corps. 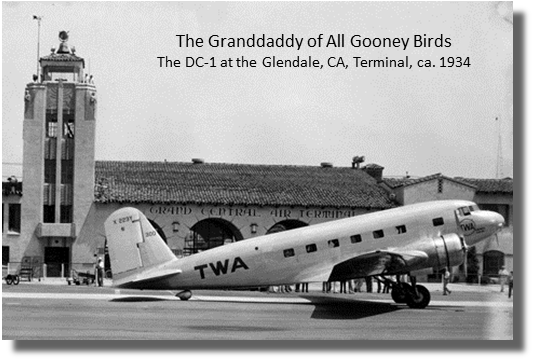 The DC-2 design was in turn modified, again in response to airline requirements. The result was the Douglas Sleeper Transport. Although originally intended to have 85% commonality of parts with the DC-2, the DST was virtually a new design. The slab-sided DC-2 fuselage was widened by 26 inches, now becoming oval shaped, and stretched to accommodate 14 Pullman-like sleeper berths. Wing span was increased by 10 feet and a new tail assembly and improved main landing gear were incorporated. Configured as a day transport, the aircraft could seat up to 28 passengers. This basic airframe became the DC-3. The DST first took to the air on 17 December 1935, exactly thirty-two years after the Wright Brothers historic flights at Kitty Hawk, North Carolina. In September, 1936, American Airlines inaugurated coast-to-coast sleeper service from Glendale, California, the Los Angeles terminal, to Newark, New Jersey, at that time the principal airport in the New York City area. American's DST passengers could travel cross-country (with three stops) in an average time of 17 hours, 30 minutes. By the time the United States entered World War II, Douglas had delivered more than four hundred DC-3s of various configurations to U.S. and foreign customers; of the 322 airliners operated by U.S. domestic airlines, 80% were DSTs or DC-3s. Source: René J. Francillon, McDonnell Douglas Airceraft Since 1920: Vol. I. Putnam (UK), reprinted 1995.